For someone like me with a sweet tooth and eyes bigger than my stomach, this isn’t necessarily a bad thing. I’ve got the recipe books, I eat the goodies and I love the fact you can legitimately eat a miniature cake topped with half a pack of whipped butter and icing sugar cunningly disguised as ‘frosting’. But in amongst all the big, bold sugar-bullies, another slightly more subtle sweet treat is on the ascendancy. 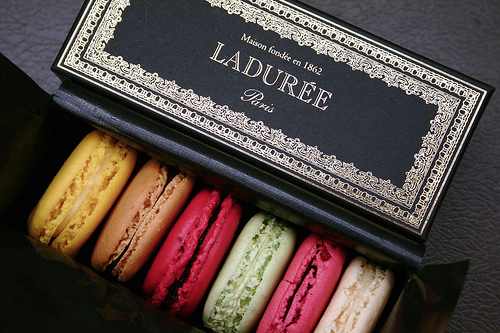 Laduree Macarons – the ultimate sweet treat? Yep, I’m talking about macarons. Delicate and round, crisp on the outside, smooth and soft in the middle and sandwiched together with the merest suggestion of ganache, the macaron packs a sugary punch well above its feather-light weight. Although I’d seen the beautiful window displays in Ladurée, more fashion-collection and jewel-like than food, I have to admit they weren’t particularly high on my radar. But a couple of weeks ago my parents mentioned that they were going to Paris and my Dad asked if I’d like him to bring me back some macarons. Of course I said yes, but being the impatient type , once I had the idea in my head, I wanted to see if this French delicacy was something I could make myself. 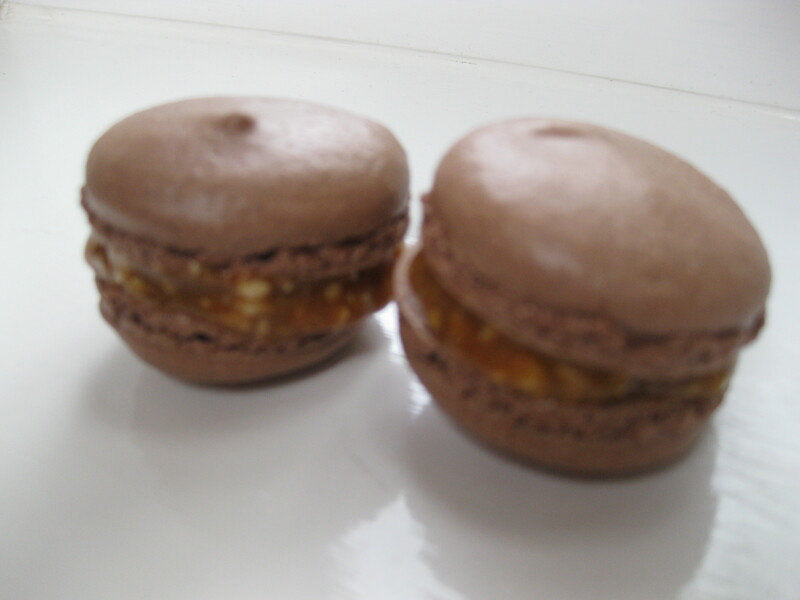 I had a quick scan of my recipe books, and found a gorgeous sounding salty peanut and caramel macaroon (note spelling difference) recipe in Ottolenghi, The Cookbook. In fact it features a double page spread of macaroon variations, so I decided to mix and match to make this Snickers version; rich cocoa shells filled with itchingly sweet dulce de leche, offset by a subtle crunch of sea salt and peanut. Possibly a little vulgar for French sensibilities – Pierre Herme might not approve – but totally delicious nonetheless. I couldn’t have asked for better results first time round. The macarons turned out perfectly crisp with an egg-shell like crust, soft, almost meringue-like centre and a beautiful ‘foot’ – the crackly ringlet surrounding the flat side of each half. The simplicity of the recipe and apparent adaptability drove me online to see what other variations I could find. All I can say is I’m glad I did my googling after this first attempt. The web is full of words of warning about the difficulty of making macarons, as well as numerous tips for achieving that perfect texture – ageing egg-whites for up to two days, leaving the mixture out for hours before baking, stirring the mixture exactly 50 times…the list goes on. Some of these tips sound pretty good (for the best summary, see David Lebowitz’s brilliant blog), but the onslaught of advice is also a little off-putting for the amateur baker. Yes macaron-making requires a little more technique than slinging together ingredients for a batch of brownies, but even brownies can go wrong if you’re not careful, and in much the same way macarons can definitely go right. This recipe is the perfect introduction, and once you’ve cracked it there’s so much fun to be had – from simple chocolate, vanilla or coffee through to more exotic combinations such a lime and basil, chocolate and passion fruit, salted caramel, rose, orange and more. And you can probably consume a whole box before you reach the calorie equivalent of an American-sized cupcake. Happy days. Preheat the oven to 170 degrees C/Gas Mark 3. Sift together the icing sugar, ground almonds and cocoa in a large, dry bowl. Take a third of the meringue and fold it into the almond and sugar mix. At this point my mix looked really lumpy and weird, like dried out breadcrumbs, so I started to worry something might have gone wrong. It hadn’t. Once vaguely incorporated, pour the sugar/almond/egg mix into the remaining meringue and fold gently (this is important so you don’t knock all the air out) until fully incorporated. The resulting mixture should be smooth, thick and glossy. To make the filling, mix the peanuts, dulce de leche and sea salt together. Taste to check salt levels – you want sweetness balanced by a fair amount of saltiness, a bit like peanut butter. 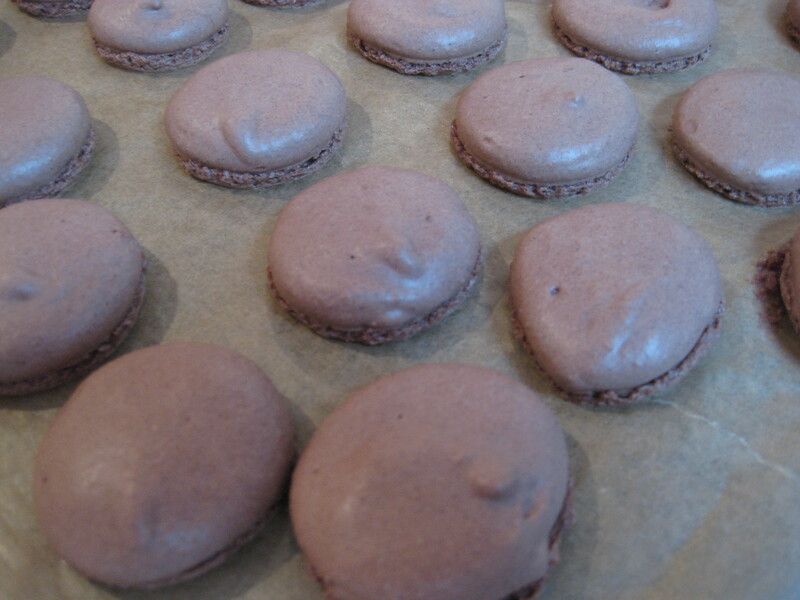 Spread or pipe a blob about the size of your thumbnail onto a macaron half and sandwich together, squeezing gently. Leave to firm up at room temperature or pop in the fridge to speed up the process (although remember macarons are best served at room temperature). Enjoy. Well done! They look perfect! I hate making these, they are so tricky to make! Ah thank you. Honestly, this recipe is so simple and the results were gorgeous. I can be quite impatient with recipes so it stands up to me it must be good 🙂 definitely recommend trying. 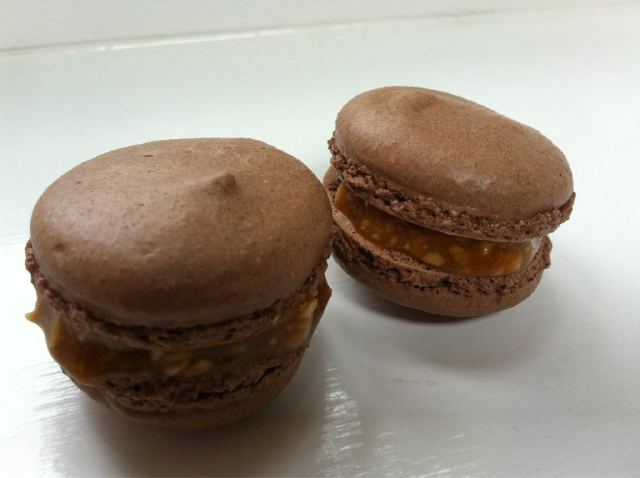 Snickers macarons sound fabulous! I love the sound of that caramel filling. They are so yummy – we’ve already polished off the lot! 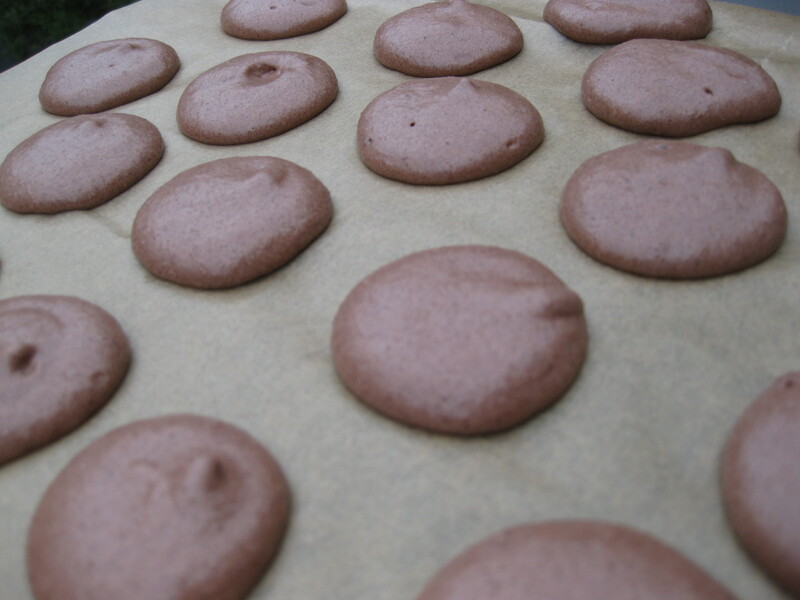 Did some research online afterwards and David Lebowitz does a recipe for ketchup macarons – very bizarre. I’m sticking with the salty caramel I think! I have been too scared to make macarons after hearing all the dire warnings people give, but this has inspired me to give them a go this weekend. Great tips and an amazing sounding filling too…can’t wait! You definitely should. Unless it was some kind of flukey beginners luck they really weren’t difficult. I always think of him for savoury dishes and interesting veg but Ottolenghi definitely knows what he’s doing with baking too!